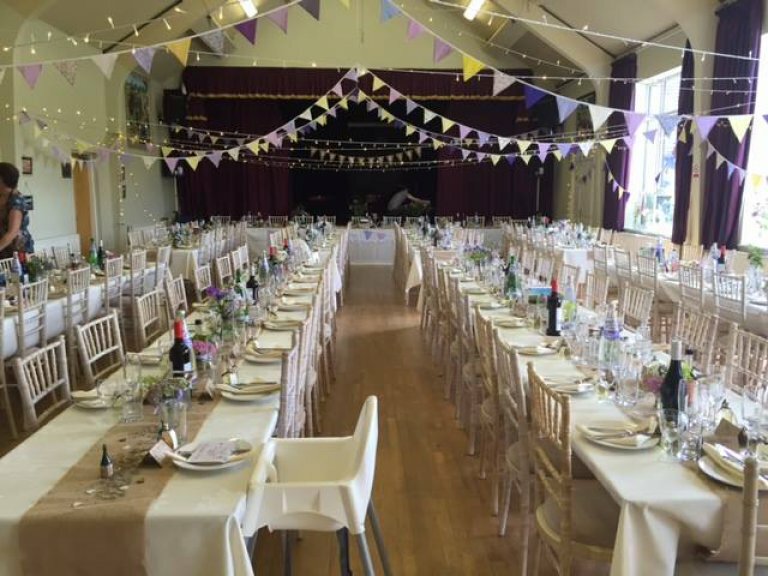 If you are planning a party or celebration then Ashover Parish Hall Events Centre is the perfect place. The pretty village of Ashover offers the perfect backdrop to any kind of event and our modern facilities provide all you need to create an unforgettable anniversary or birthday celebration. 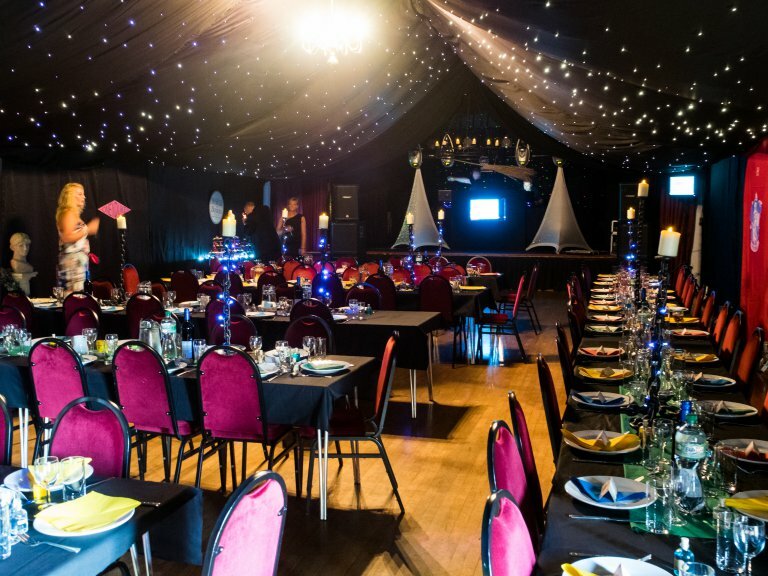 The Amber Hall is the perfect size for a family party, company dinner or school prom, seating 150-160 people for a sit-down meal using refectory style tables. Using 5ft diameter (152cm) round tables, 130-140 people can easily be seated for a meal. For an informal, non-seated event, up to 200 guests can be comfortably accommodated for dancing and a buffet supper. If more space is required for welcome drinks, entertainers or to lay out a buffet, the Rattle and Fabrick rooms can also be hired. The Amber Hall has double doors leading to the patio area which can be used for reception drinks, a BBQ or a marquee/gazebo to create more space. The patio extends into the village field which, with the adjacent children's play park, provides younger guests space to stretch their legs. If you want to go the extra mile and make the room look extra special, why not have the beautiful marquee lining? The lining is fitted inside the Amber Hall by J & CA Fisher Marquee Hire who can also provide matching chair covers and sashes. 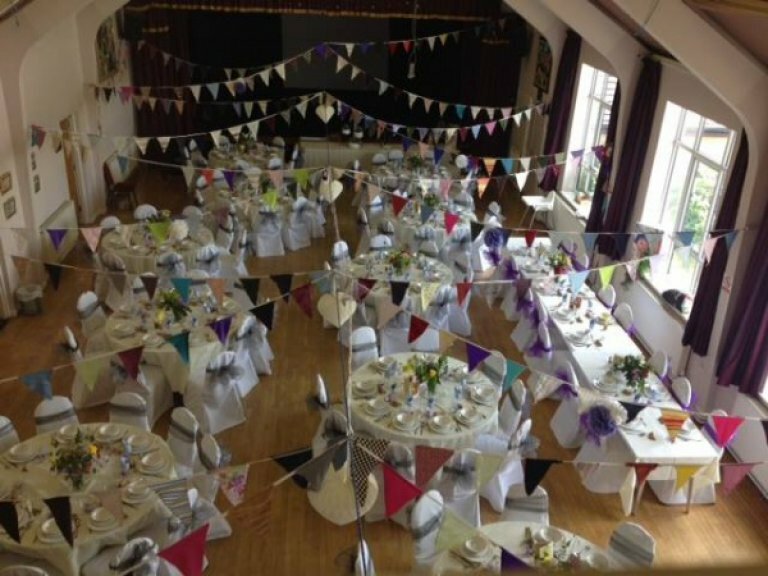 Alternatively, if you want to be creative and have a 'DIY' approach to decorating the room, we can provide ceiling ropes from which you can hang bunting, fairy lights and paper lanterns (see the photos on the right hand side of the page). They are plenty of plug sockets down each side of the room to plug in any additional lighting (although the centre's electrical system is protected, we require any electrical items to be PAT tested). We can also recommend local companies who can assist with decoration. The Amber Hall has a fully built-in audio-visual system which includes microphones for speeches, a CD player for background music and a projector with a 3m wide screen for photographic image presentation. Its stage is a perfect platform for a band, DJ or singer. The mixing desk on the stage allows bands and DJ's to connect their equipment to the Hall's PA system (on production of a valid PAT testing certificate). Professional stage lighting is also available. Whoever you employ to provide catering will find all the appliances they need in the fully-equipped kitchen to whip up a mouth-watering meal. We have compiled a list of local caterers who use good quality, local produce and have been recommended by previous users of the the centre. Also listed are decorating firms, bands and DJs, the majority being suppliers we have been working alongside for many years. If you have any questions or require assistance in planning your event, please contact us and we shall be more than happy to help. You can also see our blog for tips, information and advice about planning the perfect function.